Oh how we love restaurant and retail employees! The dedicated on-time hassle-free hard workers. After years of working closely with various service-oriented businesses, we know that food and customer-oriented businesses have some of the most skilled workers. The ones we wish we could duplicate and have on staff 24/7 – oh how we appreciate you! Restaurant and retail employees are in the hardest positions that are critiqued endlessly and not praised nearly enough. The long hours, holidays and pure craziness at some parts of the days. We couldn’t do it with them. But like every place of business, there are also those not-so on-time employees, the ones with the super crazy personal life, who the customers find eccentric but can never remember the weekly promotions? Admit it. Every business has both kinds of employees on their rooster. Not all of us can be completely 100% perfect all time, and as much as we all try to be, it’s really okay that sometimes its not possible. So we really can’t expect our employees to be. But with imperfection we know comes some associated cost. So if we can’t expect perfection, who will pay for these mistakes? How can we avoid them as much as possible, with as little negative impact on our customer’s experience? How can you ensure your customers are getting consistent and effective service while still being able to afford to keep your doors open? The best option to truly diversify your location while improving overall efficiently is the addition of a digital signage display. Digital display boards are truly an asset to any business who uses them, but especially in restaurant and retail locations where they can really help in customer decisions. Along with keeping your product pricing organized, well designed digital menu boards & displays will literally attract and interest your customer into your products. A good digital display or menu board will have many attributes that make them successful but a few of them are things like having a nice clean layout with space well utilized. Proper imagery and effective item placements are also crucial in the visual success of your digital display. By making the items easy to read and compare, you reduce the indecision from the customer and reduce the time your employees are repeating items back to the customer. Helping your customer make a clear decision will also help speed up your overall service. Food is pricey and having the wrong prices means the cost is too much or too little. Either your customer will over pay or you will lose out: which do you hate more? Both are pretty bad for business. Employees typically don’t know about things like food costs, overhead or taxes, so they may not realize how critical it is for pricing to be correct – but it’s a big deal! You must have the most up-to-date prices available to the customers for the well-being of the business. Digital menu boards and point-of-purchase displays help to ensure locations have the most accurate and up to date information available. And since they can be changed even off-site there is always the possibility of an owner or manager making an emergency change when necessary. Yea. That seems pretty obvious to most but some people would still miss that if it were tucked in-between something familiar to them. Employees and customers alike may miss a deal or promotion because they simply were unaware. Even if they are regular and frequent customers, there’s still a chance they chatted with the sales associate about everything besides the current sales. That doesn’t make them a bad sales associates but it’s definitely something you can avoid! Digital displays help ensure your most profitable and enjoyable items are recommended to your customer every time. Simple animations and subtle call-to-action elements help increase the awareness of product promotions and sales. Electronic signs have been shown to generate up to 32% growth in repeat buyers and with the introduction of beacon technology ( how-to coming soon!) you are able to easily identify the frequency of a customer and what items they would like. It makes for a great experience for both you and they customer. Now, could you imagine a customer coming into a retail store, they walk around briefly and find a pair of jeans they like. Immediately they purchase them. Sounds like an owners dream huh? A smooth sale with no hassle or much effort needed. This is definitely the ideal transaction – if you only sell jeans lol! Most stores like retail locations have more than 1 product they are trying to sell. Most likely you have add-on or matching items that compliment your core products, you try and sell too. Now say a similar customer comes in to purchase a pair of jeans. The customer seems to know what they want and the jeans are already on sale. You’ve told the customer about the nice sale shirts that matches this purchase but they decline and decide to purchase the jeans anyways. A great sales person will have already reminded them of the other promotions you are currently having but the customer seemed unphased. At the counter, there’s an interactive point of purchase display that allows the customer to quickly cycle through the newest in-season tips and trends. This fun yet informative digital display helps them realize they didn’t need a shirt for these jeans but a different shirt for another pair they had at home. Sometimes that fresh idea is all they need to deepen that brand connection. Suggestive and up-selling are not only key revenue builders for all retail businesses but they deepen your customer relationship too. Not only has digital signage been shown to improve performance of disengaged employees it also helps motivate buyers too. According to reports disengaged employees account for 70% of the workforce – that’s a lot of people! Digital display systems that project positive images and brand values will help customers and employees alike remember your overall message. Awareness and recognition for things like social or economical change are key to today’s customer and should be worn like a badge of honor. If you are a good company, good people want to know and be involved in your cause. As long as you tell the story in a meaningful way the good people will come. Digital menu boards and display systems are not only a fun looking addition to any location, they are becoming more and more prevalent in any location looking to keep their customers happy while they are in their location. As long as these are well designed, maintained and send the right message, you really can’t go wrong. 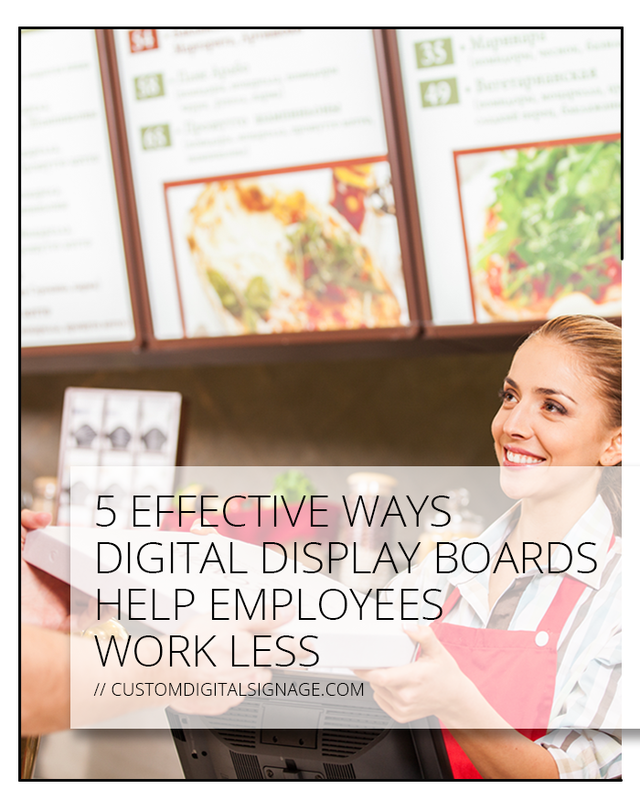 How have you seen digital signage and display systems used to help efficiently or delight? Which have been the most creative displayed?